I have searched the internet to find out more information about a particular railroad spike that my father was given when we was young. The two spikes are from a small section of railroad in/near Illinois that was built by prison workers. He was told they we Mulehead spikes. The started out as straight pieces of metal but after pounding, they became flat on top like a flat head or “Mulehead.” I have seen pictures of a similar spikes at RR museum sites but none that are specific to that area or from the prison workers. If you have ANY information on these spikes or could direct me to someone who could provide some further assistance, please let me know. Thank you for your time. 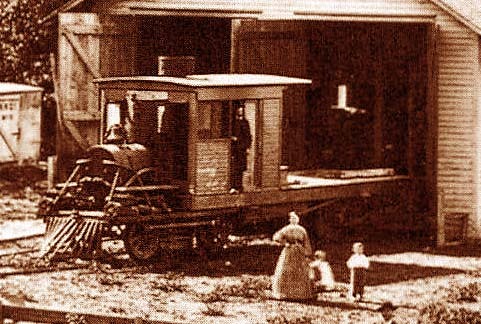 "Argenta" was the name assigned to one of the Schenectady locomotives ordered on 1 Feb 1869 by the CP and built for them, but then sold to other companies before being delivered to California. Then name was subsequently assigned to the old SVRR No.1 "Sacramento" when it was incorporated into the CP roster at No.166 by 1 March 1870. I do not know that it was a "dinkey", but it was a Hinckley (the way SP spelled it) – 14 x 20" cylinders, 48" drivers. Oregon engine, the Betsy Baker, in 1867, see comment.